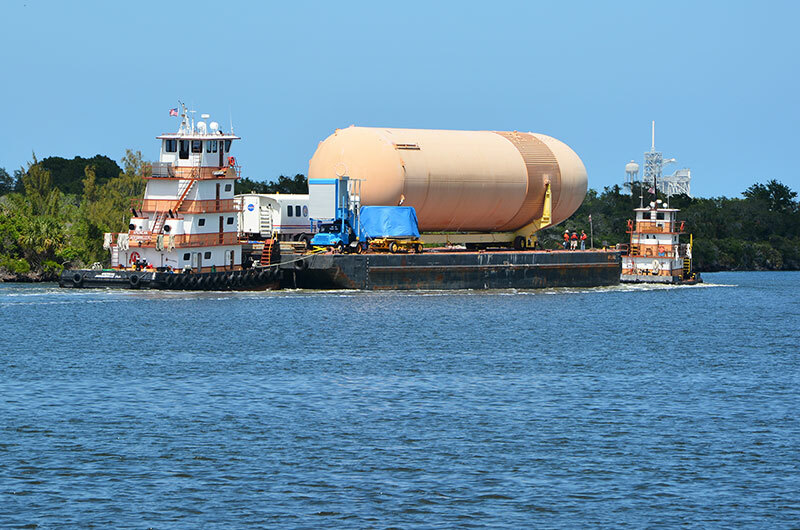 The last of the space shuttle's massive orange external fuel tanks located at NASA's Florida launch site left Kennedy Space Center by barge on Wednesday (April 24) — but it's not going very far. The 154-foot-long (47-meters) external tank, one of the shuttle program's original test articles that for years was displayed at Kennedy's visitor complex, departed the spaceport for the Wings of Dreams Aviation Museum at the Keystone Heights Airport in Starke, Fla., about an hour southeast of Jacksonville. ...the tank, along with several other large shuttle artifacts including a nose cone and aft skirt of a solid rocket booster and the crew transport vehicle that astronauts rode in after landing the shuttle at Kennedy, were making the first leg of their journey to the Wings of Dreams by water, before embarking on a still-to-be-scheduled 55-mile (88.5-kilometer) road trip to the museum. Was the External Tank stored at the VAB since November? No, it was held at the surplus yard on Ransom Road located near Space Commerce Way and State Road 3. Geez, I'd never even heard of this place and I grew up in North Florida. The museum is relatively new, having only been established in 2005. They do not yet have any exhibit buildings (they previously had a hangar at the airport but it was needed for other purposes). They have organized a few air shows though, and are gearing up quickly to start displaying the aviation and space artifacts in their collection. I've been in Gainesville for an academic conference the last day or so, and took time this afternoon to drive over to the Wings of Dreams Aviation Museum at Keystone Airpark near Starke. You may remember the museum received several pieces of Shuttle hardware, including the test article External Tank that used to be on display at the KSC Visitors Complex. Right now the museum is operating out of an office trailer while they're raising funds and making preparations for the museum complex. I dropped in only expecting to see what was in the current museum, and one of the volunteers on duty started to give me a guided tour. They have a display near the entrance about the External Tank and other items, but when he learned I was really interested in spaceflight, he said: "Well, if you've got some time, I can show you some of the other stuff we have." I'm glad I did, because he drove me to a hangar that's packed absolutely full of Shuttle-era hardware. One of the highlights was being taken to where the crew cabin section of the Shuttle simulator is in storage. There are no words to describe standing there within the simulator, peering over into the cockpit, and knowing all the history written within that simulator. There's so much packed into that hangar that I couldn't begin to list it all (though the 6-foot-tall model of the VAB comes to mind! ), but if they're able to make this museum project happen, it's going to be something else. Later in my visit my guide drove me over to the other end of the airfield, where the SRB components, the crew hatch access vehicle, the crew transfer vehicle and some other items are in storage. We went aboard the CTV, which was another "wow!" experience. I didn't expect to get the "behind the scenes" tour - in fact, they ask that you call ahead - but since it happened to be a slow day, I got an unexpected surprise, and it made the drive completely worthwhile. If any of you are in the area, give these folks a call and see if you can arrange to view the artifacts in storage. They seem like nice people with a cool vision, and I hope they can make that vision become a reality soon.